After going on ten mission trips over the years, my heart is full of real life accounts of hearts renewed, families strengthened, lives made whole, people being healed by the Lord's miraculous hand, children singing hymns and prayers being answered in ways beyond my wildest dreams. You've joined me when I shared about the leper lady's story and her crawling to church; you encouraged me as I sought to Listen and Follow the Lord even when it wasn't perhaps "convenient" or easy; when only a pair of shoes changed my perspective; when one scary night almost took my life but my King answered in a mighty way. I must share their stories, what the Almighty is doing in all corners of the globe. I have witnessed too hearts being captured by His, seen too people healed before my eyes, heard too many fervent prayers, and hugged too many malnourished children to be silent about how our great God is working. This is the true account of God calling to Himself a dangerous man in a remote village in Panama. Luis* (name changed) was a man of alcohol, a man of wrath and violence, a man to be feared. He was the village drunk, a thief, a man who had murdered on several occasions. If you could help it, you avoided Luis at all costs...because if you didn't...well, you might not live to tell about it. In 2002, a Ngobe Bugle tribal pastor was traveling through Luis' village and decided to stop and preach there. This pastor knew of Luis and how fierce and dangerous he was, yet God had called him to be bold in his faith. He sought out Luis and shared the Gospel with him. Much to the shock of Luis' family and fellow villagers, Luis actually let the pastor share and didn't harm him. The Holy Spirit was working on Luis' heart and opening it up. The pastor shared how Luis was separated from God because of his sins and that he had a chance to repent and be forgiven. The villagers couldn't believe it when their village drunk, the man of violence, thefts, and murders repented and asked God to forgive him. As the pastor left, the villagers were still in hiding, wondering if Luis had really changed. But Luis was a different man, a new man. No longer did he drink, fight or resort to anger and violence. He was forgiven, he was free! Six years passed. Luis continued to be a changed man, one transformed by God. Then God began laying something on his heart. See, there was no church in Luis' village, no one to continually share the Gospel and shepherd believers. The Lord continued transforming this former murderer's heart and called him to be a pastor. What years ago everyone would have scoffed at and would've never believed came true - Pastor Luis began ministering to others in his village. For one man far away in a village not on a map, a Bible in his own language is his prized possession. 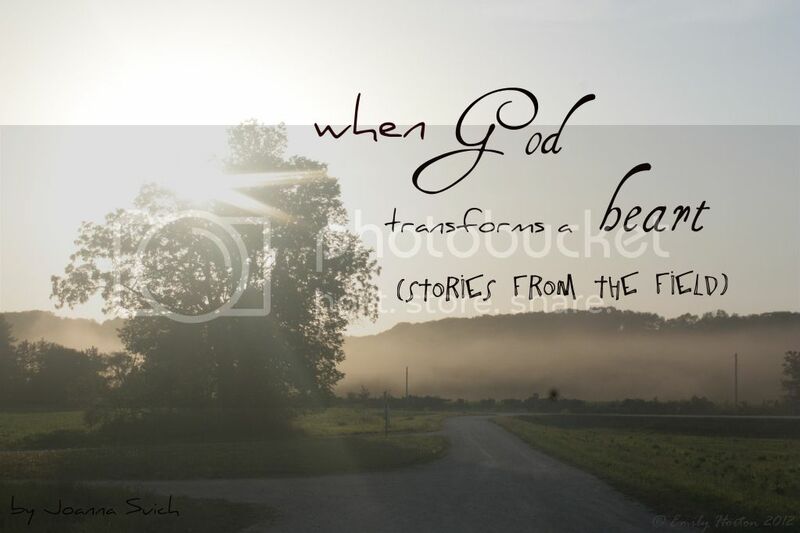 And I look at my photos and remember Luis' story and remember - God is still in the business of transforming hearts!